Here's our 2009 review of Philips' OLED lighting panels, and here's a second review we did in the same year of another panel. In December 2010 we posted an interview with Philip's OLED unit business chief. In 2016 Philips introduced its first OLED TV, the 55" 901F, which is now shipping in Europe. Since then Philips' TV lineup includes OLED TVs in the premium TV segment. Dietmar Thomas from Philips (and personally a good friend) is our second featured personal OLED interview. If you wish to be featured, contact us here. Dietmar Thomas, Manager Brand & Integrated Communication OLED at Philips: which means basically “making noise” for OLED lighting and being a good ambassador worldwide. In my position I switch frequently from being the OLED spokesperson to being a writer about OLED lighting and being a lecturer. In addition I oversee the communication on Lumiblade’s social media channels as well as setting up the new marketing material and campaigns… You get the idea. What was the last book you read? Tom Clancy “Command Authority” – although fiction and a couple of years old, unfortunately very close to today’s events in East Europe. 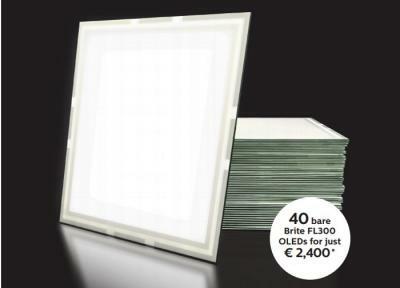 Philips launched a new OLED lighting sales campaign today, offering Brite FL300 OLED Lumiblades for just 60 Euros a piece. The 40 panel package sells for €2,400. The current price for a single FL300 panel is €136, so this is a a discount of over 50%. Philips tells us that with this package the want to make it easier for smaller OEMs to make their first steps into OLED lighting, and they see this enabling Philips OLED luminaires dropping below the €400 price level. 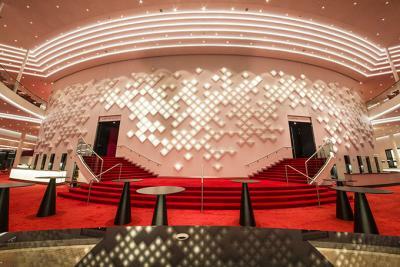 Stage Entertainment built a new theater in Hamburg, Germany, and they installed 460 Philips Lumiblade Brite FL300 OLED panels on the foyer in a beautiful installation done completely by Philips Lighting. The square OLEDs are spanning the complete wall, and they are constantly changing their light output. Philips says that Stage Entertainment chose OLEDs because they proved to offer a much more even light output compared to LEDs. Interestingly the luminaries aren't flat against the wall, but still the whole instillation looks extremely good. TPVision (who owns the Philips brand for TVs) has been working on OLED TVs for a long time (we first reported on this in 2012), and now the company announced its plans to launch a Philips OLED TV in 2015. The company uses OLED panels supplied by LG Display (which also supplies OLEDs to Panasonic, Grundig, Changhong and Skyworth. And maybe Sony, too). According to a report from Holland, TPVision already showed a prototype OLED TV. The company planned to release this TV sooner, but had some major issues with the OLED panel - low brightness (compared to LCDs), uniformity issues and limited lifetime. TPV is developing its own image processing technology which will be used in their OLED TV and will solve those technical issues. In April 2009, Philips started offering OLED lighting panel samples (and was the first company to do so). For over 5 years, Philips shipped many types of OLEDs, but they were still considered a technical gadget. The panels were offered via a special Lumiblade online shop. Today Philips told me that OLED is now an official "product" of Philips. The lumiblade shop is closed, and the OLED panels will be available via the normal Philips OEM shops. Currently this only so in Europe, but this will soon be true globally. Philips says that "OLED sample time is over" - OLEDs have matured enough to become a real lighting product. Philips seeks worldwide lighting partners to "take OLED lighting to the next level"
Philips today announced the Lumiblade Innovators Club - a call for 100 worldwide lighting developer partners that will "take OLED lighting to the next level", and invest in the future of lighting. This innovators club (which costs €5,000 to join) gives access to a special support team and technical advice - and most crucially Philips' marketing and media support. Philips actually wants to make these partners the central subject of its OLED brand campaign. In November 2013 Universal Display signed a collaboration and evaluation agreement with Philips' OLED lighting unit, under which UDC will start supplying Philips with sample PHOLED materials. Today UDC announced that Philips signed a commercial material supply agreement. This means that Philips intends to use UDC's materials in commercial OLED lighting products. 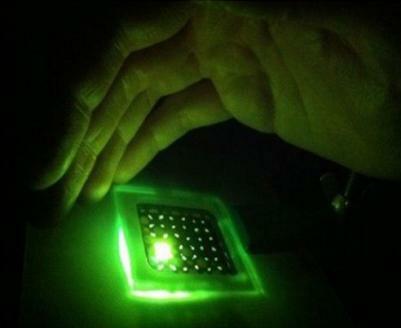 This is not surprising as it is widely accepted that UDC's PHOLED materials are required to produce efficient OLEDs. Who will be Universal Display's next key customer? Three weeks ago, Seeking Alpha published my first article on Universal Display, titled "Universal Display: 20X Jackpot In 2018?" - in which I presented my best-case scenario for the OLED market (and UDC) in 2018. I think the article was received well, and today SA published my second article - "Universal Display's Second Key Customer Is On Its Way". In this new article I explain why Samsung Display is such an important customer for UDC - and how I expect in that in the coming years UDC will diversity its key customer base as I expect LG Display, Konica Minolta, Everdisplay, BOE, Philips and LG Chem to start mass producing OLEDs soon. Update: It turns out that the researchers did not fabricate an OLED lighting panel, but a small monochrome (green) OLED device. Researchers from Philips, Graphenea and the University of Cambridge developed a new graphene-based transparent electrode that outperforms ITO in OLED devices. Graphene by itself is not a good electrode material because the concentration of the charge carriers is low - which means that you need to dope it with excess carriers - while leaving it flexible and transparent. To achieve that, the team used a metal oxide film (molybdenum trioxide, MoO3) as an intermediate layer between the graphene and the OLED layers. The work was performed as part of the EU project GRAFOL, aimed at roll-to-roll mass production of graphene. Philips' OLED lighting division has a new head of Marketing and Business Development - Jay Kim. Before he was responsible for OLED product marketing, business development, MarCom and customer services functions globally, Jay headed Philips' industry segment marketing in Europe involving Philips LED luminaries, lighting controls and services. And he was kind enough to agree to this interview here at OLED-Info. Q: Jay - thanks for your time. Let's jump, shall we? In March 2014 Philips announced the FL300, your brightest OLED yet at 300 lumens. Any updates on this panel? Is it still on track for Q3? We are very happy with the performance of the new Brite FL300 and its acceptance in the market. Already before official market introduction at Light+Building we have had three designs where the brightest OLED on the market is used. Italian furniture maker Riva1920 uses our OLED in its K BLADE lamp, an exceptional beautiful wooden desk lamp combining 48,000 years old Kauri wood from New Zealand with the world’s most modern lighting technology – OLED. Besides that, German Designer Thomas Emde is using the Brite FL300 in its new series of OLED luminaires sold under the label OMLED. In addition, he is working closely together with Italian luminaire manufacturer Luceplan. Together they bring the OLALAL OLED luminaire to the market. Also, many of our customers with designs based on the Lumiblade GL350 OLED are going to switch to the new OLED as well.